June’s topic will be a 40 minute DVD titled DUST CONTROL MADE SIMPLE, by Sandor Nagyszalanczy. It’s a comprehensive, up to date, and very informative video packed with good information for every woodworking enthusiast. This video offers valuable information for those with the most humble of wood shops all the way up to the commercial sized shop with central dust collection. 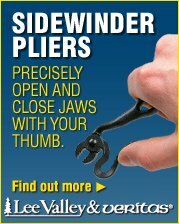 This is a Must-See for health and safety minded woodworkers. 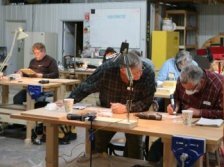 This month will feature a presentation by Roland Johnson on the basics of setting up a bandsaw and a comprehensive overview on bandsaw blades and will be held at the Paramount in Downtown St. Cloud. The topic for this month's CMWA meeting will feature a video by author Jeff Jewitt titled HAND APPLIED FINISHES. "Simple tools and the correct techniques are all it takes to produce flawless finishes by hand." The January CMWA meeting will feature a video titled SPRAY FINISHING MADE SIMPLE by Jeff Jewitt. Join us to learn from a well-known authority on finishing who combines his vast knowledge of the subject with the latest technology. The annual Central Minnesota Wood Expo is Saturday, March 17, 2011 from 9:00 AM to 3:00 PM at the St Cloud National Guard Armory. Hourly Prizes - a GRAND PRIZE! We are looking forward to the our annual holiday potluck with the members and their spouses on Wednesday, December 21st at 6 pm, in the Paramount Theatre and Visual Arts Center (Basement). Please bring something to eat and share with others, and serving utensils if needed. All else will be provided (beverages, plates, silverware…). NOTE: We will be starting at 6:00PM, which is one hour earlier than normal meetings. At this month's CMWA meeting Alex Neussendorfer is going to be the featured speaker. The subject is the basics of relief carving. Alex is going to explain the tools and basic processes plus show us how to carve a simple Tudor rose, an easy decorative addition. Join us at the Paramount on October 19th at 7 PM. This month the meeting will be in Studio C at the Paramount. It's the studio at the end of the entrance hall, the one with the hardwood floor and all the nice lighting. John Wilson will present a device he has developed that allows you to carve using a Dremel tool. We will meet at Wednesday, August 17, at 7 pm in the Paramount Basement in Downtown St. Cloud. The CMWA summer picnic is being hosted by Denny Myers and Roxanne Wyatt at their shop near Royalton (7505 Hillton Road, Royalton). The club is providing the meal; a donation of 5.00 per plate would be appreciated. There will be several grills set up if you would prefer bringing your own grillables, but the CMWA will be providing brats. Bring a dessert to share and be a hero. Bring your family and join us for a great evening of camaraderie and food.